Dare to cycle on a track hundreds of metres above ground? Or free fall down the world’s steepest ride? 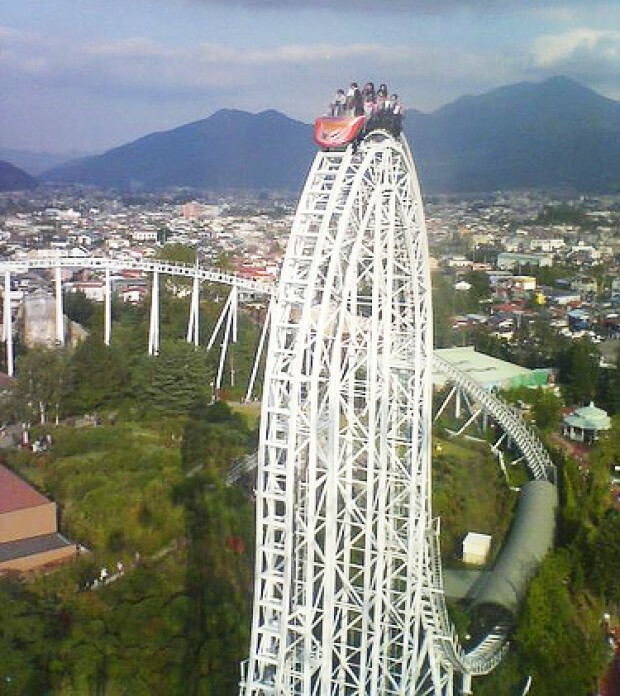 Here are some insane roller coasters you have to try. For all adrenaline junkies out there, something is extremely addictive about these stomach-churning machines that bring us near-death rushes. Addictive enough for us to not mind hour-long queues, ridiculously priced theme park tickets and nauseous aftermaths, all for that two minutes of thrill. 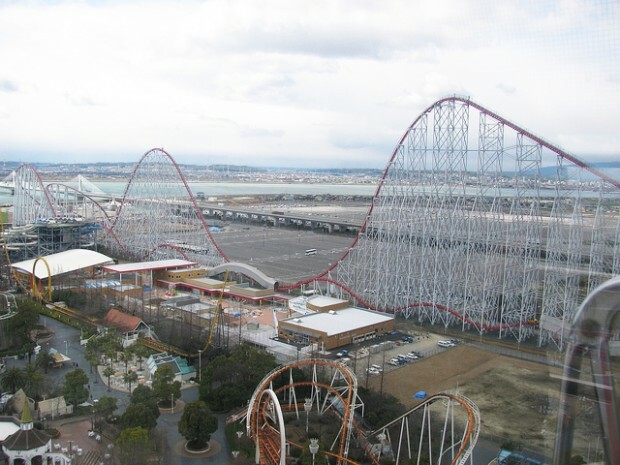 If you’re with us on this, let’s take you on a walk through the baddest, fastest and craziest roller coasters across theme parks in Asia you have to try before you die. Starting off this list with a bang, Formula Rossa is the world’s fastest ride and accelerates at such an insane speed that riders are made to wear protective goggles. In less than two seconds, this turbo-charged thriller reaches a speed of 200 kmph. 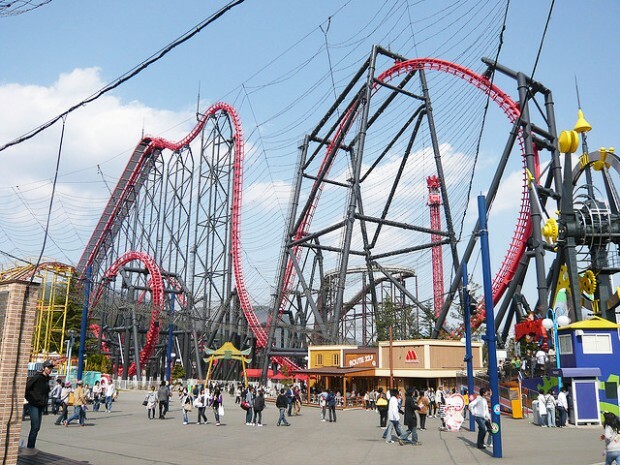 Riders are said to experience a Ferrari F1 racing simulation by going on this coaster. Dodonpa is the roller coaster with the world’s highest launch acceleration of 2.7 g. Riders are made to wait in a darkened tunnel in anxious suspense pre-launch and once they are thrown out at the intense speed, the steel coaster fires straight up the massive 17-storey hump which has over 90 degree drops on each side. Launched in 1999, Vanish’s route isn’t your average roller coaster. 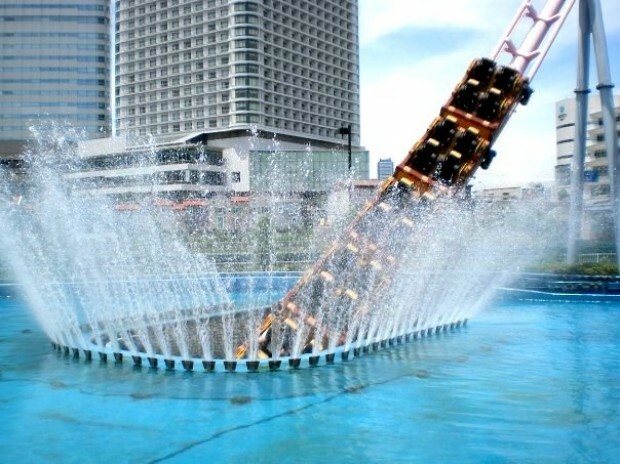 This one of a kind underwater ride sends unsuspecting riders diving into the water from a 10-storey height. 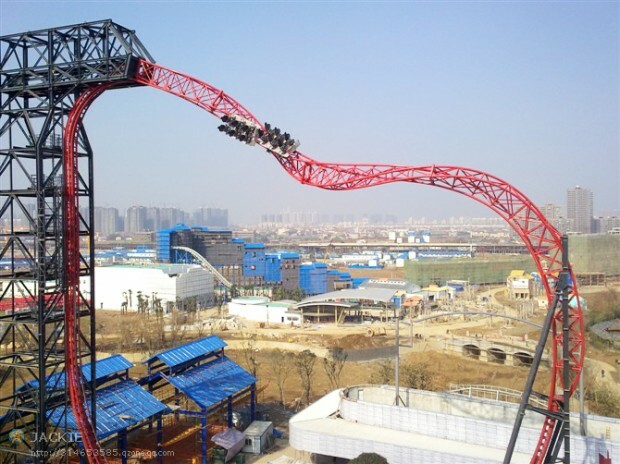 Gravity Max is the world’s first roller coaster to introduce a 90-degree tilt drop. 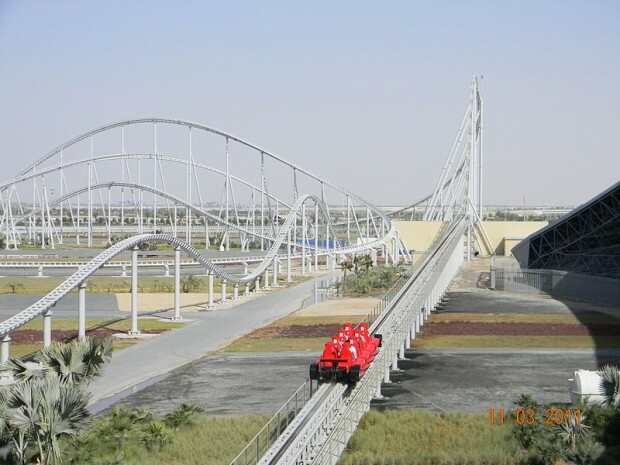 The coaster track is segmented into two and riders are slowly tilted down on the first track until it is perpendicular to the ground, before the track fixes itself onto the second and launches the coater downwards on a gripping free fall. These abnormally disjointed tracks adds on to the risky thrill this ride offers. 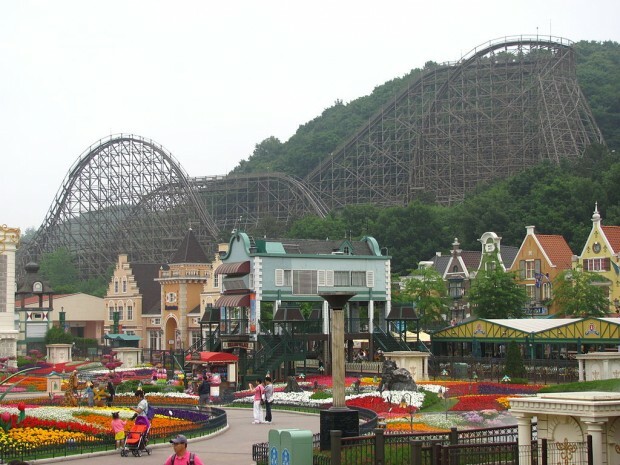 This massive 18-storey wooden structure has claimed the title of “Number 1 Wooden Coaster in the World” for several years. Covering 1.5 km of track and featuring drops over 70 degrees in angle, T Express is also the steepest wooden roller coaster in the world. The long queue for this impressive ride is said to be made entertaining by the park staffs, who would carry out mini games with people in the queue and grant winners express passes. 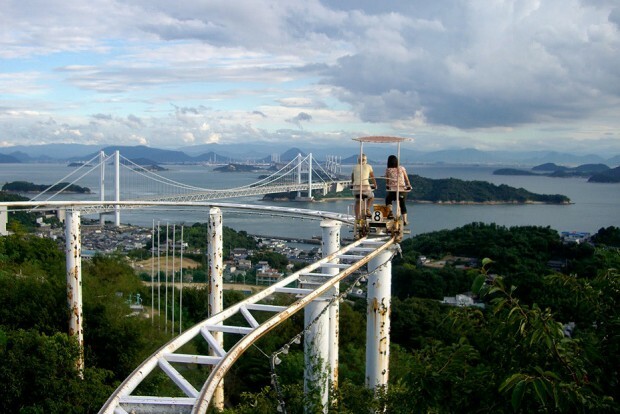 Combine extreme sightseeing and dramatic cycling and this is what you get – a pedal-powered roller coaster overlooking Japan’s Inland Sea. Stripped away from speed and loops, like what typical roller coasters offer, The Skycycle provides riders with a refreshing yet equally heart-racing ride. This is the world’s longest roller coaster ride, spanning over four whole minutes. Many roller coasters come to a stop before we get our fix of screams and adrenaline, but not Steel Dragon 2000. With a 2.5 km long track, it is probably going to drain your vocal energy when you’re just halfway through the exhilarating course. No loops on the track? Not to worry, Eejanaika’s rotating seats will get you your fix of flips, WHILE you’re being propelled forward at 130 kmph. Eejanaika is Asia’s first 4th dimension roller coaster, whereby riders are rotated 360 degrees independently while the coaster cruises along the track. And that amounts up to an insane amount of inversions in one sitting. 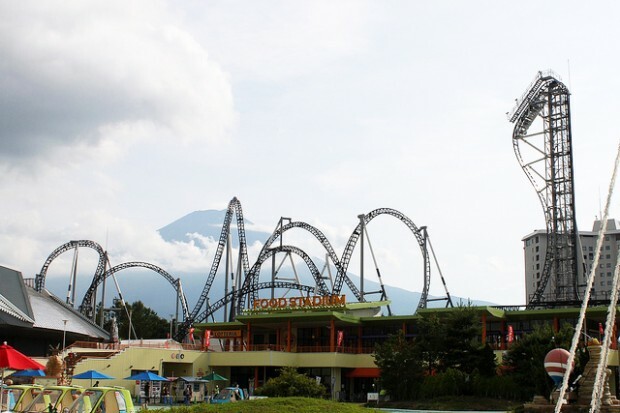 This 14-storey tall steel roller coaster holds the title of Asia’s tallest roller coaster inversion. 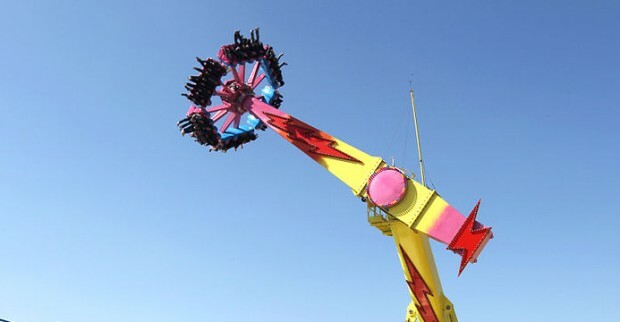 Despite the ride being rather short, riders are guaranteed their adrenaline fix as they are twisted mercilessly through the multiple inversions towering 46 metres off the ground. 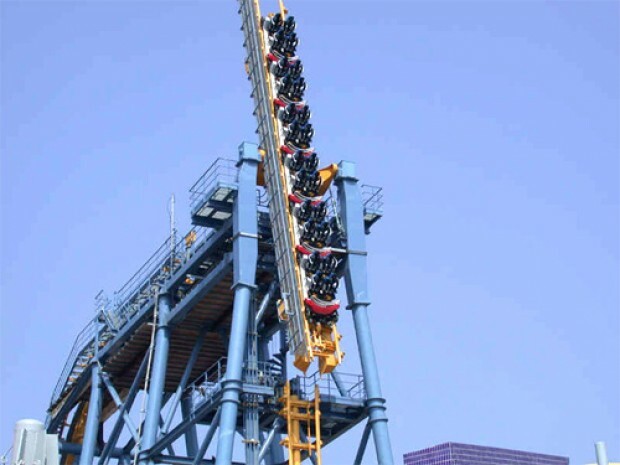 Hair Raiser is not only the first floor-less roller coaster in Hong Kong, it is the fastest as well. As riders sit without any flooring beneath them, their feet swing freely while the coaster hurls them around. This sense of insecurity definitely adds on to the thrill. 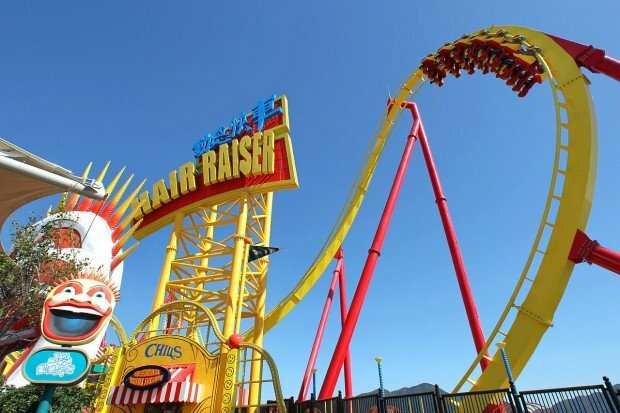 Hair Raiser is also situated on a cliff edge overlooking the ocean, offering riders a picturesque view through their ride. Do not be fooled by this adorable ride name. Palace of Unicorns is located in Suoi Tien, a bizarre Buddhism theme park that excites and baffles guests in equal measure. 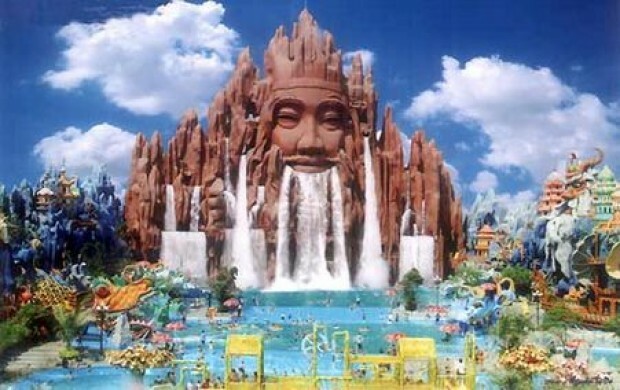 This morbid ride, which is constructed to depict life in hell based on Buddhist beliefs, sends riders through a ride accompanied by mutated statutes and blood-curdling sound effects. During your visit to Suoi Tien, make sure you try fishing at its very own alligator pond as well. This pendulum ride is a classic thrill-seekers’ favourite. The coaster rotates and oscillates at the same time, with its swing’s amplitude increasing for each oscillation. And when it eventually reaches its peak, riders are inverted and rotated mid-air, leaving them feeling all weightless and blood-rushed. Its agonisingly slow speed is what makes this impressive six-storey ride a mental joyride. Plus, this ride doubles up as a panoramic sightseeing adventure as well. 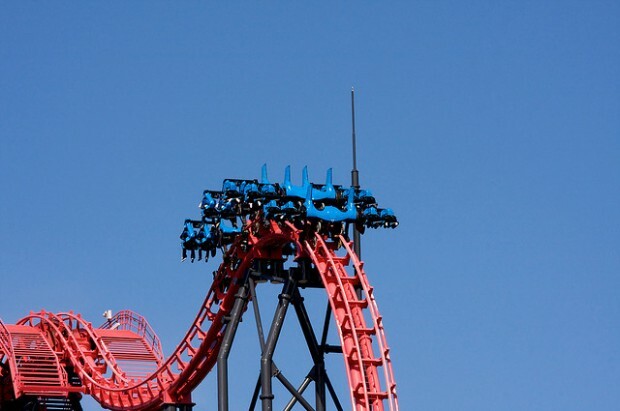 Let’s welcome the last on the list – the world’s steepest roller coaster. Takabisha raises the bar for thrill-seekers as it boasts the steepest vertical drop you’ll ever experience, with a tilt of 121 degrees. Is that even humanly possible?! Also, keep your eyes wide open as you plunge down the sharp incline as riders are able to catch a glimpse of the snow-capped Mount Fuji along the way. 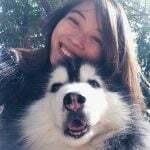 Jerlyn has an unhealthy obsession with BattleBots and hopes to catch a live match at the arena someday.